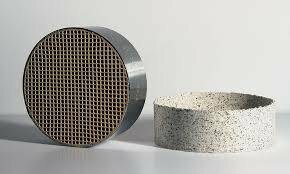 This is a replacement Catalytic Combustor with a metal band. It is 5.66" round x 2" tall, true size with metal band is 6" round x 2" tall. 25 cells per square inch. These come with a 5 year Manufacturer's Limited Warranty. These fit some of the following stoves: American Eagle, American Road, Carolina, Colorado, Concorde, Consolidated Dutchwest, Grizzly, Dovre, Energy King, Englander, Evica, Hart, Hearthstone, Jotul, Oak Ridge, Panda, Royal Scot, Rupp, Scandia, Sears, Seneca, Shenendoah, Sierra, Sweet Home, Timberline, Travis Industries, US Stove, Vermont Castings, and more.